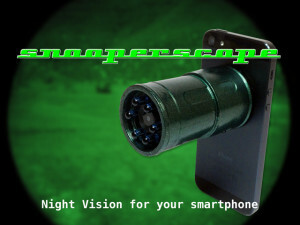 Snooperscope is a Night Vision gadget for your smartphone or tablet that enables the human eye to see in total darkness and improves visibility in low lighting. The applications for Snooperscope are only limited by your imagination. The night vision capabilities enhance home security by allowing you to see outside, or inside your home, even in conditions of total darkness – providing a piece of mind. It’s the perfect tool for wildlife enthusiasts, camping, or just to know what rascal is getting into your trash cans at night.